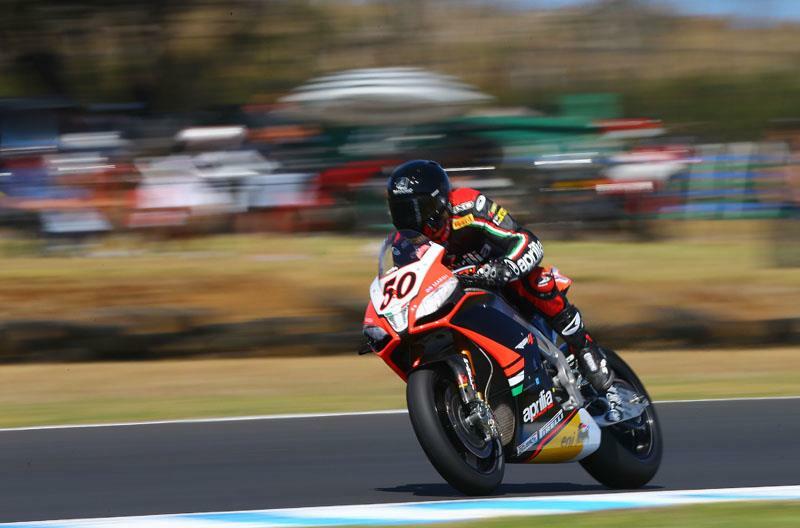 Aprilia dominated the opening round of the 2013 World Superbike Championship, with factory riders Sylvain Guintoli and Eugene Laverty first and second, and Red Devils Roma Aprilia rider Michael Fabrizio rounding out the podium. Laverty led off the line for the first half of the race, until Guintoli picked his way through the battle for second at the half way point, catching Laverty on lap 14. Fabrizio also left himself with work to do, going from his front row start to 13th at the end of the first lap, but slowly working his way forward to battle with Laverty in the closing laps, before a last lap overtake saw Laverty win the dash to the line by 0.007. The battle for third was initially between Haslam, Melandri and Checa until Checa wiped out Melandri at the Honda Hairpin on lap 13, going too fast into the turn and catching Melandri's back wheel as he attempted evasive action. Chaz Davies was the eventual winner of the battle, taking fourth on his BMW debut ahead of Kawasaki teammates Tom Sykes and Loris Baz, with Haslam rounding out the group. Haslam's Pata Honda teammate Jonathan Rea was a distant eighth, over 11 seconds back on Haslam, while Fixi Crescent Suzuki rider Leon Camier was ninth and Max Neukirchner finishing out the top ten. Checa was knocked unconscious in his lap 13 crash and has been taken to a mainland hospital for checkups, and will not start race two.